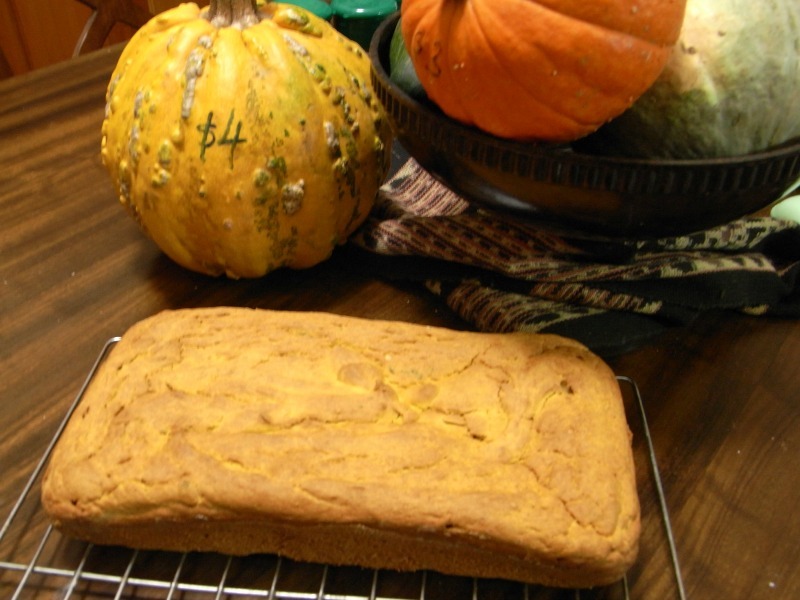 Autumn is the perfect time to enjoy pumpkin bread with fresh pumpkin. YUM! This fresh, savory pumpkin bread with herbs is such an easy pumpkin bread recipe and wonderful with cream cheese. It had been a lovely warm autumnal Sunday, but suddenly the sky turned black and I knew a storm was coming as Jessie (the dog) was suddenly tripping me up non-stop. As the rain started to clatter on the roof, I thought the time had come to put the oven on and finally do something with the roasted pieces of pumpkin I had in the fridge from two days before. I’d cooked them up when I was making some roasted veggies in the oven on Friday night. So I put some relaxing music on the CD player in the kitchen, put all the lights on so I could actually see what I was doing, and proceeded to brighten up a dull afternoon. 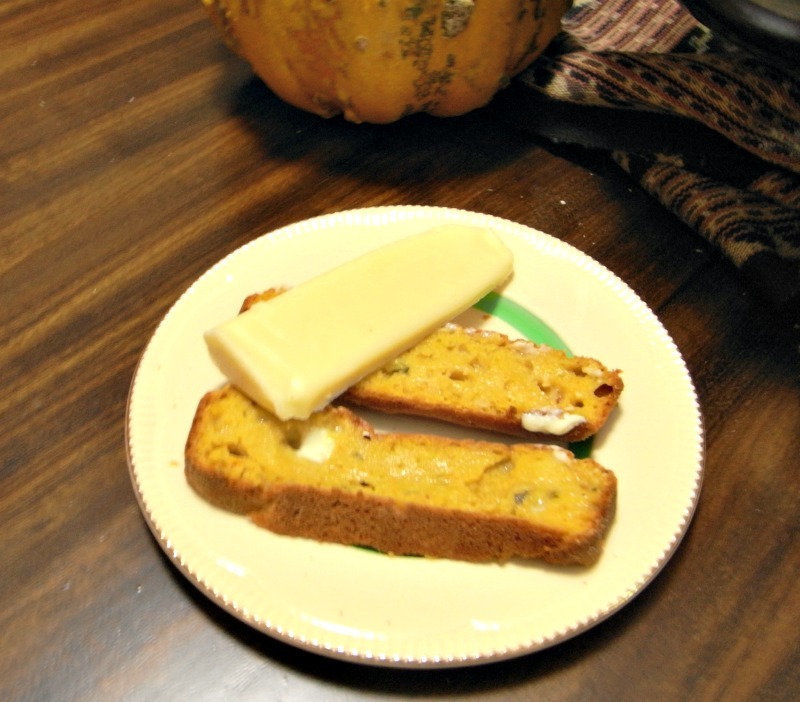 Luckily I had run out to the garden and got some herbs before the rain started, as I had been wanting to make this fresh pumpkin bread with herbs all morning, but things kept getting in the way. 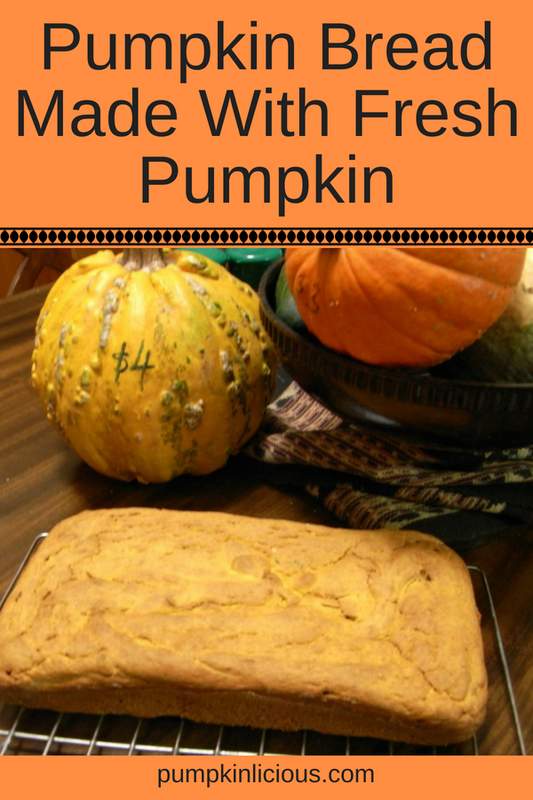 Using fresh pumpkin to make bread is so much better than using canned pumpkin. Of course, if you’re in the mood for pumpkin bread in the spring, you might need to get a can of pumpkin puree and use that instead. I was lucky today, as I had already roasted pumpkin from a couple days ago. Gathering my ingredients was quick and easy. 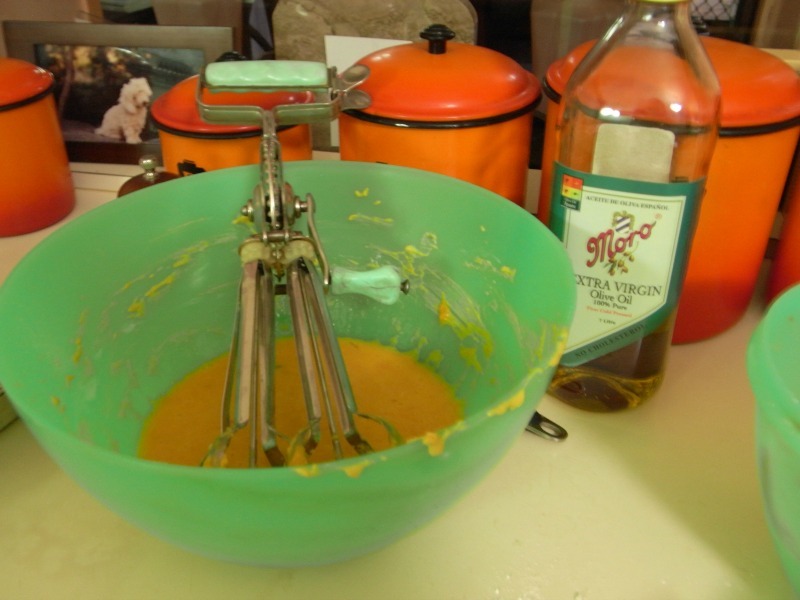 I then used my big green bowl and my favorite “ancient” egg whisk to mix the mashed roasted pumpkin, eggs, oil and milk. After I added the rest of the ingredients , it was baking time. Mix roasted pumpkin, eggs, oil and milk. 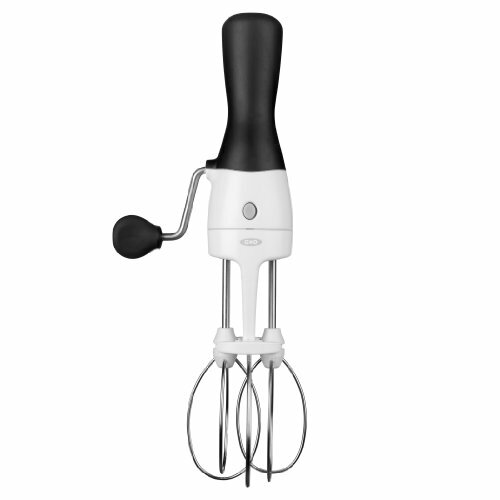 Add the rest of the ingredients and mix until all ingredients are integrated and turn into a thick mixture. Bake for an hour at 350F until it looks brown on top and a toothpick comes out clean. 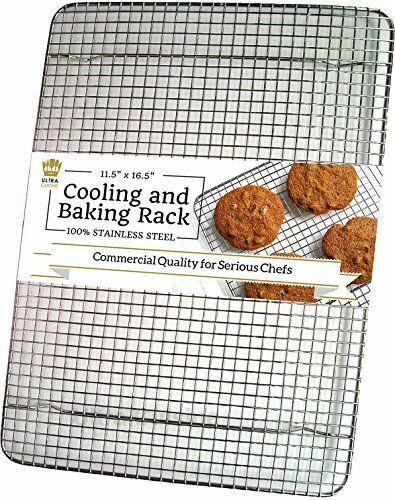 Let it cool on a rack before cutting and eating. 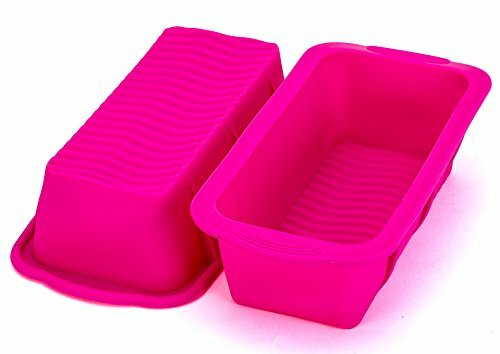 Note to self – buy some new cake tins – maybe those funky new silicon ones you just peel off? I couldn’t resist trying it straight away, though I was in the middle of making my next recipe – a pumpkin bread with spices and walnuts. So I cut a piece, spread it with yummy butter and had it with a piece of Gouda. I think it would be amazing toasted with cream cheese too, so I’ll try that tomorrow.